We walked north on the Via Calzaiuoli. This is a much wider street than what we had experienced before with numerous upscale shops. Along the way, we came upon the Orsanmichele. Built in 1337 as a grain market, it was converted to a church between 1380 and 1404 for the use of Florence's guilds. Detouring northwards, we came to a square that was the center of the city in Roman times. The Column of Abundance marks where the Roman forum was located. The square reflects 19th century urban renewal efforts undertaken when Florence was the capital of Italy after the reunification (1865-1871). Around the square are cafes and shops. 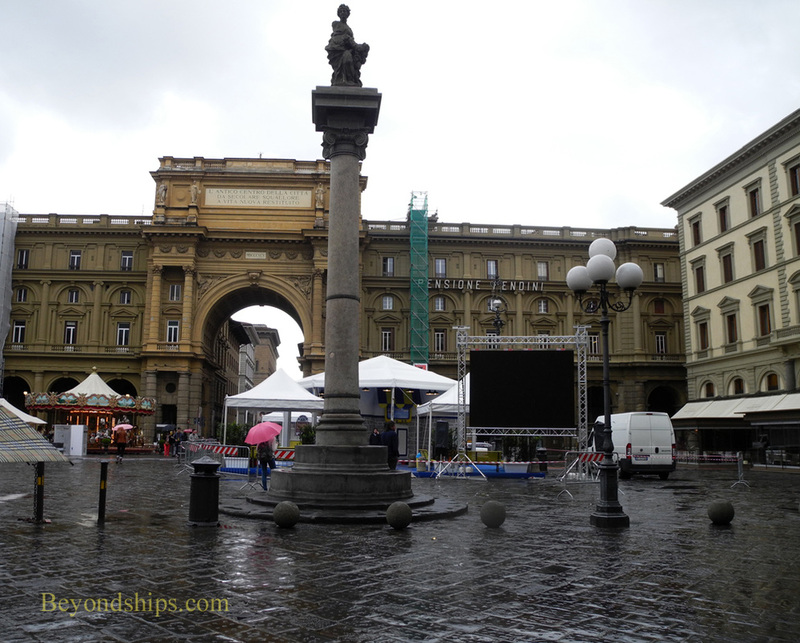 Returning to the Via Calzaiuoli, we continued to Piazza Duomo (Cathedral Square). The three religious structures that dominate the square are a startling white, contrasting sharply with the dark color buildings, which prevail in the rest of the historic city. 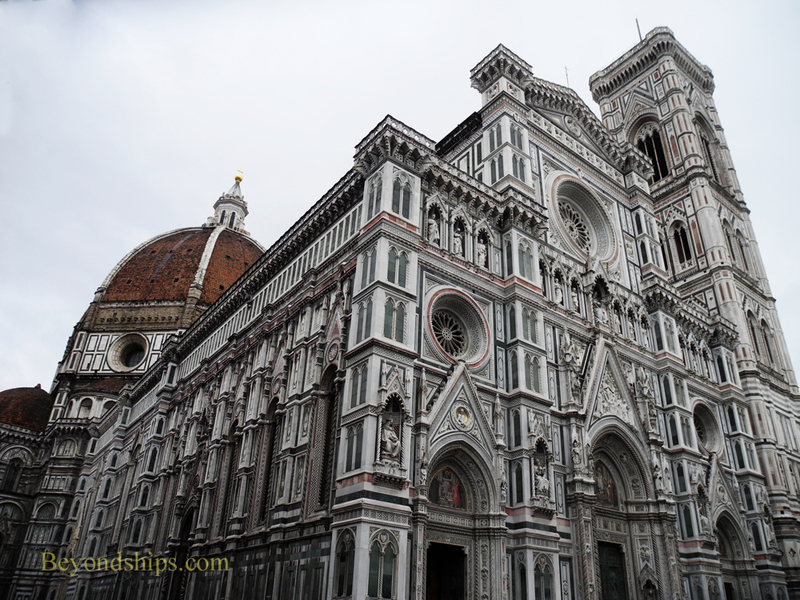 The centerpiece of the square is Florence's cathedral, Basilica di Santa Maria del Fiore. It was begun in 1296 in the Gothic style. The same architect who designed the Church of Santa Croce, Arnolfo di Cambio, was the principal designer. Work proceeded for 140 years until the dome was completed. It was consecrated by Pope Eugene IV in 1436. However, the exterior facade of white, pink and green marble dates from the 19th century. Admission to the Cathedral is free. However, there are usually long lines waiting to enter. Above: Visitors can climb 463 steps to the top of the Cathedral's dome. Along the way, they get a close view of the frescoes on the inside of the dome. Next to the Cathedral is the free-standing Campanile di Giotto. Its principal architect was the painter Giotto di Bondone. Construction began in 1334 and ended in 1359. The tower is 276 feet (84 meters) high. It houses seven bells. An interesting tidbit about the tower is that the top three sections were built so that each was larger than the one below it. As a result, the effect of perspective is, at least in theory, negated so that each section appears equal. Visitors can climb more than 400 steps to the top of the tower using a narrow staircase for a view of the city. There is a small charge to enter the Campanile. The third major component of the Piazza Duomo is the Baptistery of St. John, (Battistero di San Giovanni). 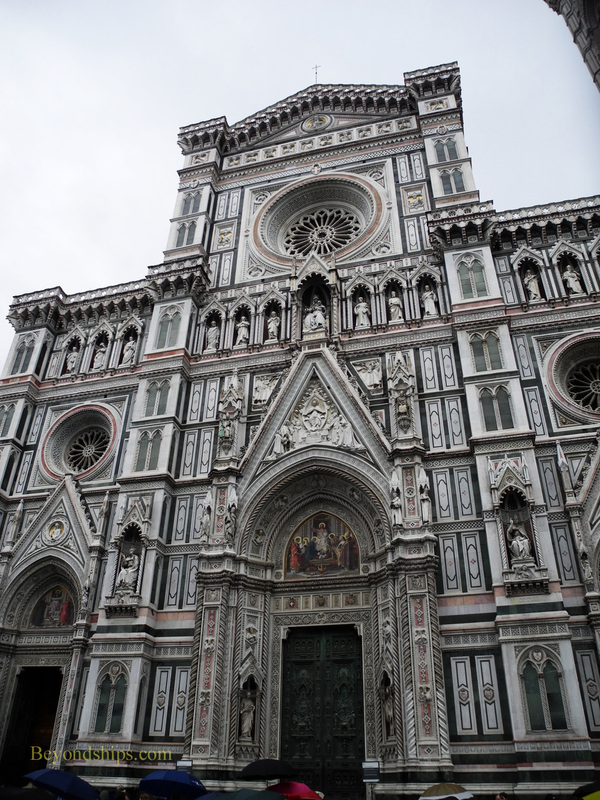 One of the oldest buildings in Florence, it was begun in 1059 and finished around 1150. The eight-sided building is done in the Florentine Romanesque style. One of the important features of the Baptistery is its doors. In particular, the east doors facing the Cathedral, so impressed Michelangelo that he reportedly said that they were fit to be the "Gates of Paradise." The name stuck and Lorenzo Ghiberti's Gates of Paradise are considered a major work of the Renaissance. (The original doors are in the Cathedral Museum, Opera del Duomo). There is a charge to go into the Baptistery.